After the WA Nats, I want to get busy and fabricate some grandstands for next to the track. I will want to populate them with some scale people. I've did some searching and come to realize that I won't be able to use 1/64 scale people, if I could afford to do that, I'd build a real drag racing car . It's between choosing either 1/72 or 1/50 scale. Both seem readily available at a reasonable cost. My question is; for those that have populated their track with scale people, what scale, between the two, has proven most satisfactory? I will be acquiring some 1/64 scale people for the starting line area, where most of the close up photos will get taken though. next to a car and even then you need a sharp eye. 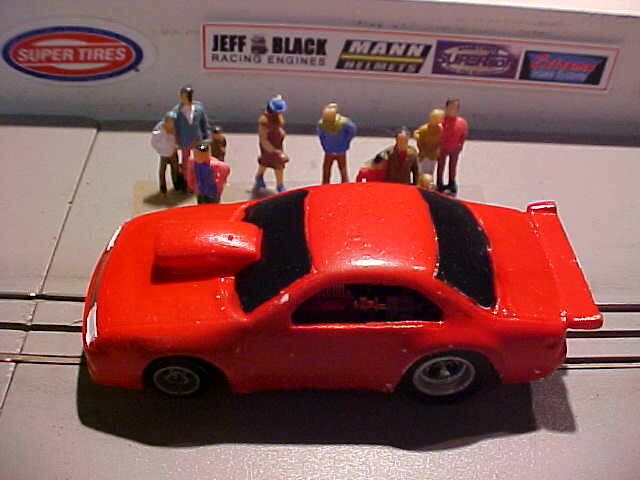 Here is a picture of what I used on my track, they are 1/87 size figures. The difference in size to a 1/64 is about .1 of an inch so it is tough to tell the difference. Wow! Those 1/87th look really good next to that Beretta, appreciate the photo! That really helps! I'm definitely leaning towards the 1/72. I think, like you said, in the grandstands, it would all even out. I have a mixture of 1/64, 1/72 & 1/87. One thing that you must remember is that real people are not all the same height so if they are mixed in a group they will look fine.